For the second week in a row, the debate over a planned mosque near the World Trade Center site raged in the blogosphere. But this time, a different set of voices dominated that conversation. From August 16-20, 14% of the news links on blogs were about the mosque controversy, according to the New Media Index from the Pew Research Center’s Project for Excellence in Journalism. One week earlier, the same topic was the second biggest story in the blogosphere (18% of the links), and in that case, the commentary was dominated by anti-mosque voices. 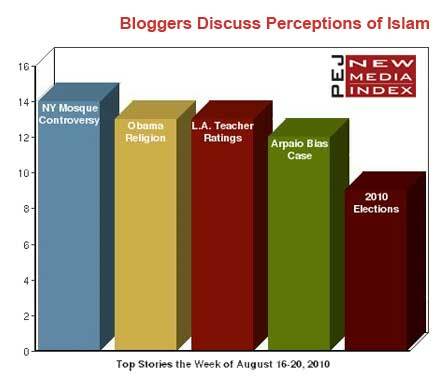 But last week, bloggers in support of the planned mosque rose up. Most responded to a column by Charles Krauthammer who argued that the center should be located elsewhere for "reasons of common decency and respect for the sacred." These bloggers disagreed and felt cultural sensitivity is trumped by the legal right of Muslims. "Rights are not symbolic abstractions," wrote Maha on Mahablog. "A right that cannot be exercised is not a right. Krauthammer and others on the Right keep saying they don’t dispute the right to build the Islamic Center on private property, but are saying the Center shouldn’t be built." An anonymous blogger on MyBrainItches seconded that sentiment "We allow you the right to practice your religion and will allow it to you under the laws of our land. That’s who we are and we need to show a higher class of citizenship." Other bloggers attacked the underlying premise of Krauthammer’s article: that the cultural center would be too close to Ground Zero for comfort. "Those Americans who oppose the plans to build an Islamic community center at 45-51 Park Place seem to tie all Muslims to the September 11th attacks," Hector Luis Alamo, Jr. wrote at Young Observers. "Their fear and misunderstanding of the issue was exemplified by the columnist for The Washington Post Charles Krauthammer when he likened the proposal of an Islamic community center in Lower Manhattan to a Japanese cultural center at Pearl Harbor, a German cultural center at Treblinka, or even a "commercial tower over Gettysburg." One of the few anti-mosque bloggers who commented last week questioned the wisdom of protecting all types of religious establishment under the law. "Under the First Amendment defense, should not more radical Islamic views be protected as well?" Brian Castner wrote on the Buffalo Repat blog at WNYmedia.net. "I don’t even mean Al Qaeda, or a front for Hamas providing materiel support (both illegal). I just mean the occasional fiery speech supporting strict Sharia law. Where is the line? If less than moderate Muslims preaching at this site gives you pause, then we are not so far apart." The mosque debate also resonated on YouTube last week where the third most-viewed video featured MSNBC host Keith Olbermann arguing for keeping the project near Ground Zero. And it topped the mainstream news agenda last week as well, accounting for 15% of the newshole in PEJ’s News Coverage Index from August 16-22. On the ideological and debate-oriented cable and talk radio programs, it filled a striking 45% of the airtime studied. The commentary on these programs, though, was more mixed on both sides of the controversy. If some bloggers saw the furor over the construction of the Park 51 center as evidence of Islamophobia in the U.S., the news that growing numbers of Americans believe President Obama is a Muslim also stoked some anger. Tied for the No. 2 spot on blogs (13% of the links) was a poll about President Obama’s religious orientation by the Pew Research Center (Note: PEJ is a project of the Pew Research Center). Taken before President Obama’s August 15 comments endorsing religious freedom-the poll found the percentage of Americans who think Obama is a Muslim had grown to 18%, up from 11% in March 2009. Most bloggers, linking to an August 19 Washington Post story about the poll, had harsh words for the nearly one-fifth of the public who wrongly indentified the president’s religion. Some criticized conservative operatives, the media and pollsters for perpetuating the misperception about Obama’s religion. "The poll results belie the assumption that Americans consistently support religious freedom and equality," Darren Lenard Hutchinson wrote at Dissenting Justice. "Instead, significant numbers of Americans harbor biases against Muslims (including a growing number who wrongfully believe Obama himself is a Muslim)." One blogger saw a connection between the president’s decline in popularity and the public’s skepticism of his true faith. "So the less popular Obama is generally, the more likely he is to be perceived as a Muslim?" asked Ann Althouse. "Is this fair to Obama? Is this fair to Muslims?" Still others pointed to the Reverend Jeremiah Wright controversy to make the point that Obama’s political detractors will use any questions about his religious identification against him. "My guess is that the overwhelming majority of those people who think President Obama is Muslim are people who simply don’t like his politics, and who also think that Muslims as a whole are evil (see the connection? )," wrote blogger HSCFREE. "I would also guess that some of these same people were lapping up the Rev. Wright stories. Does that make Rev. Wright, adored for his political detriment to Obama, a secret Muslim too?" KayStreet607 at Fifth Column argued that a slow August news cycle had blown this story out of proportion. "Because it’s ‘let’s be stupid because Congress is on recess and we like jumping over a cliff’ month, the story actually gets some traction, because it was reported by the ever-vigilant Washington Post" the blogger quipped. "That the question was polled at all lends legitimacy to it. That it was reported simply offers the cynical and the stupid cover to believe what is just simply not true, not relevant, and not an issue." A small minority of bloggers weren’t so sure that some Americans were mistaken about identifying Obama as a follower of Islam. "Now, why in the world would they come up with such an idea?" Debra Moore asked on Exposing Liberal Lies. "Could it be the frequent pandering to those in the Arab world, the bow of submission to the Saudi king, the hatred of Israel, the decision to order NASA to concentrate on building up Muslims, the support for the Ground Zero mosque? My, the list goes on and on. Actions do certainly speak louder than words." 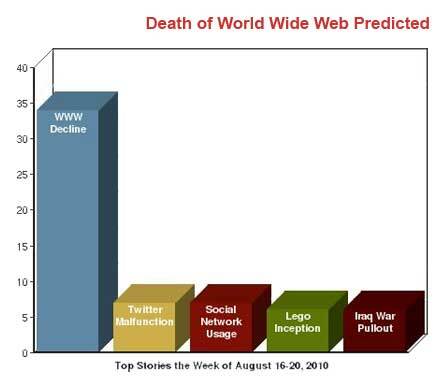 On Twitter last week an article sounding the death knell for the World Wide Web generated the most attention by far. In the August 17 cover story on Wired.com, editor-in-chief Chris Anderson and writer Michael Wolff proclaim "The Web Is Dead." The story, which garnered 34% of all links, tracks how other internet-based applications such as video and peer-to-peer networks have been growing at the expense of the web. Anderson and Wolff predict that Internet entrepreneurs will increasingly abandon the web for the app market, "simpler, sleeker services…" that "are less about searching and more about getting." Second, at 7% was a Mashable report on two Twitter malfunctions-lists and tweet counts-that affected some users on August 19. Third, at 7% of links, was a BBC story on a study of media usage that suggested the average British citizen spends half of his or her waking hours using media and communications, often multi-tasking on several devices. Twitter users also delighted in another Wired.com post, about Alex Eyalar’s Lego re-creation of a zero-gravity scene from the film Inception (No. 4 with 6%). "So a LEGO nerd has recreated Inception. http://bit.ly/bh8F4p Kick me if I’m dreaming this," Wired Tweeted on August 19. At fifth, with 6% of all links, was an MSNBC.com story reporting the withdrawal from Iraq of the last full brigade of U.S. combat forces as the troops entered neighboring Kuwait. Keith Olbermann’s August 16 Special Commentary in which he attacked critics of the mosque near Ground Zero was the third most-viewed news video on YouTube last week. But it was an off-color embarrassment on the set of a TV newscast in Britain that ended up as the No. 2 and No. 4 videos last week. Tomasz Schafernaker, a weather forecaster, was caught making a rude gesture toward news presenter Simon McCoy during an August 17 BBC national news broadcast. In a tongue-in-cheek reference to Schafernaker, McCoy said: "Now we’ll have the weather forecast in just a minute. Of course it will be 100% accurate and provide you with all the details you could possibly want." In response Schafernaker extended his middle finger as the shot switched to the weatherman. Once he realized he was on air, Schafernaker recoiled, bringing his fingers over his mouth. According to a report on the BBC website the following day, he later apologized, saying: "I am very sorry for any offence that might have been caused by my actions." Note: A number of articles that appeared among the most-linked to stories on Icerocket were removed from the blog sample this week because of evidence of spamming. This included three stories on the floods in Pakistan and an op-ed in support of Paul Wolfowitz’s leadership at the World Bank. In all cases, the blog posts linking to the story were identical and in most cases were posted on previously inactive blogs. The New Media Index counts links from blogs to stories in the press and unlike the News Coverage Index, includes sources from outside the U.S. The News Coverage Index measures what percentage of analyzed content is about any given topic in the sample, and is expressed as newshole.